Napa Valley - simultaneously known for its world-class wine and as a top travel destination for honeymoons, romantic getaways, business travel, and vinous vacations, and best experienced by the 21 years and older crowd, continues to see a surge of visitors with kids in tow. Off-season travel is generally best for both wineries and parents when visiting vineyards with a crew of kids. Avoiding weekends, high-season summer touring, and the hectic harvest time frames will improve the chances of getting more personalized tasting room attention, smaller tour groups, and will likely bode well for kids to respectfully explore the grounds with fewer hurdles. Frog's Leap - an organically focused wine estate in Rutherford, with an added (and kid-friendly) emphasis on sustainable agricultural education offers up a remarkable lineup of organic wines and family-friendly fun. From exploring the historic barn to checking out the chickens, veggie gardens and impressive vines, there's plenty to see and learn for kids (and adults) in the warm, laid-back atmosphere of Frog's Leap Winery. Keep in mind, if you've got kiddos in tow that the best tasting format for parents with wee ones would be the casual Garden Tasting experience, featuring four current release wines (don't miss the crisp, cool citrus-driven style of Frog's Leap savory Sauvignon Blanc). Gorgeous gardens, a picturesque pond, 130 acres of vines, well-made wines and a variety of tasting formats, along with friendly staff make a visit to Frog's Leap a worthwhile stop for families traveling Napa's wine trail. V. Sattui Winery - the perfect stop for a wine country picnic. An onsite, Old World Deli promises to pique everyone's appetite with a spread of bread, cheese, and market meat options. Outside, picnic tables are scattered around the estate overlooking vineyards and resting beneath the shade of old oak trees. V. Sattui's award-winning wines (only available for sale at the winery or online) offer a wide range of styles and palate appeal, making this an easy stop for first-time visitors with kids in tow or not. Sterling Vineyards - sure to woo kids of all ages, Calistoga's Sterling Vineyards transports guests from the parking lot up to the resplendent, white stucco winery via the super scenic gondola lift. With a bird's eye view of the Mayacamas Mountain Range, this dramatic winery welcomes visitors to enjoy a self-guided tour, stroll through the onsite art collection (including Picasso, Chagall, and Ansel Adams), delight in food and wine pairings, or partake in a tasting of the estate's current release wines. Tours range from $28-37 for adults, with a $10 fee for those under 21 and all kids under three are free. Castello di Amorosa - Inspired by a 13th century Tuscan Castle, Castello di Amorosa engages visitors of all ages with both self-guided and staff guided tours of the grounds. For minors ages 5-20, there is an hour-long tour of the castle with stops along the way to take in a Medieval armory, a dungeon replica, torture chamber, the historic main hall, chapel, and courtyard, along with the wine caves and a wine tasting for parents. For the under 5 crowd, a mini-farm full of animals and plenty of room to run and supervised exploration. 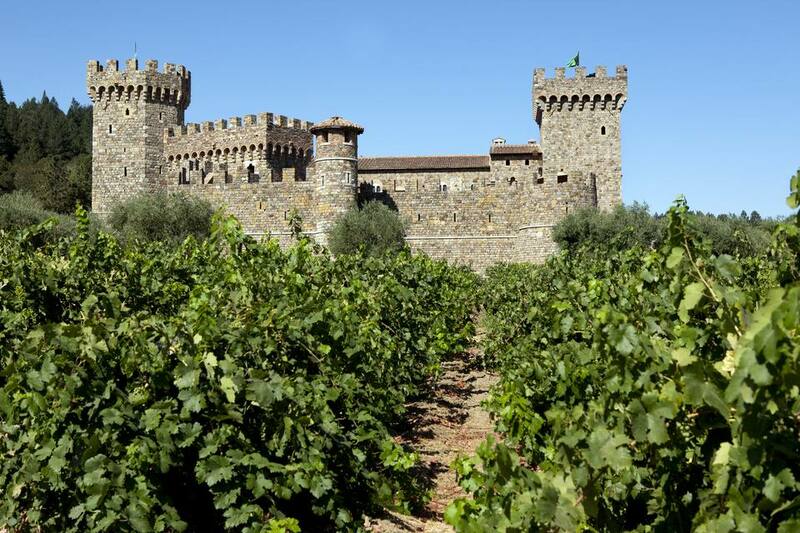 Promising a slice of Medieval Italian history along with Italian-inspired wines (think Sangiovese, Barbera, and Super Tuscan styled blends) with stunning architecture and landscapes, Castello di Amorosa is a top-pick wine stop for families. In addition to these wineries with kid-friendly formats, be sure to check with the Napa Valley Welcome Center for the latest, local wine country happenings and family-friendly activities. Curious if a wine estate on your "must visit" list accommodates kiddos? Don't hesitate to call ahead or see about making a family reservation during the week, when things are a little slower.